Team Stryker is back! Welcome to Mission 006! This is going to be a big one. I’ve got lots in store for you so strap in and buckle up for the best 24 pages of your life. This issue has characters and plots that have been on the drawing board since 2008 so it has been a dream come to true to see these ideas become more than just scribbles in a notepad. I really want to try and expand the TS universe while still making everything feel very connected and natural. I never want it to get as convoluted as the Marvel or DC universes but I do want people to feel like Team Stryker doesn’t exist in a bubble and truly nothing is off limits. The idea of the cover came to me while I was sketching at the Calgary Comic Expo back in April. Mission 006 and 007 will be my first two parter so I wanted them to feel connected in every way. I drew covers 006 and 007 at the same time but you’ll have to wait until 007 comes out to see who would dare stand and fight against Team Stryker. Once both covers have been revealed I have some special plans for it as well. Have a great Monday and welcome back! 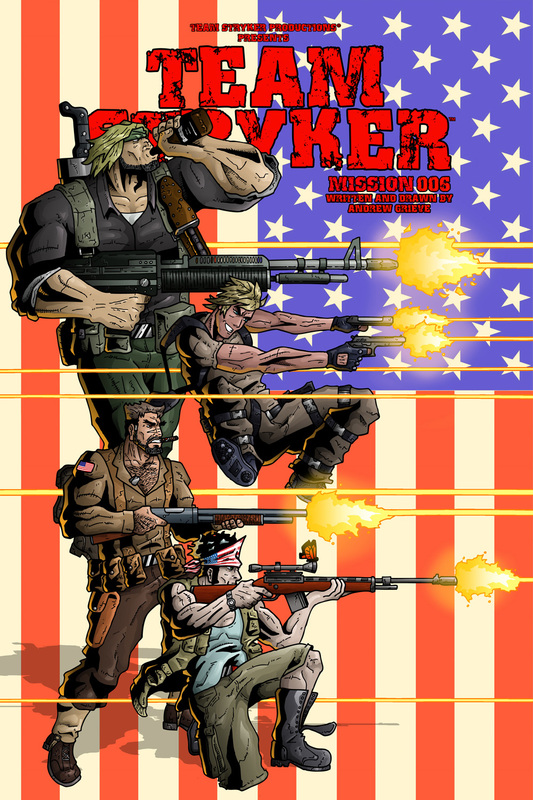 Be sure to tell all your friends that Team Stryker is alive and taking names on Twitter and Facebook! So no TS multi verse? A multi verse will come soon enough!